[May 23, 2014] The greatest of leaders around the world, all appear to have been successful in both military and government affairs. We can find examples anywhere, especially in the most economically successful nations. Regardless of how far back we look into written history, this trend is rather robust. Today, I will profile one of the better known great leaders – Augustus. Born Gaius Julius Caesar Octavianus Divi Filius Augustus (63 BC – 14 AD), he was the founder and the first Emperor of the Roman Empire. He succeeded Gaius Julius Caesar, killed his assassins, defeated Antony and Cleopatra, and became the ruler of Rome. 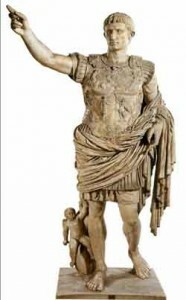 His was the golden reign of the Roman Empire, as there was an end of ongoing civil wars and peace (Pax Romana) at last. He ruled for 41 years. The selection of Augustus was easy. He is an example of a leader who did good things for his people and most importantly, was able to bring peace to a land that had experience decades of civil way. Like other successful leaders, Augustus gets high marks for both his successes and for his high moral character. His achievements rank as some of the greatest in the history of humankind. There are quite a few very good websites on Augustus. Below are some of the better ones where a good idea of how he worked to achieve peace and restructured government is detailed.